Yik Yak: The anonymous messaging app with a terrible rep is actually pretty great. The anonymous messaging app gets a ton of bad press, but actually, it’s pretty great. 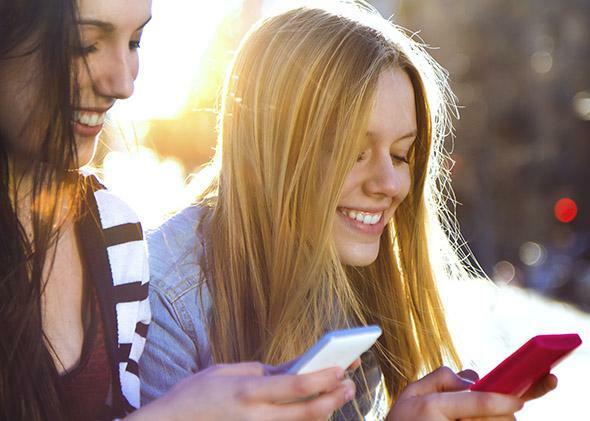 Young women who just may be using Yik Yak responsibly. The New York Times finally downloaded Yik Yak this weekend, and it did not like what it saw. Yik Yak is a year-old app that allows people to post random anonymous thoughts to other users within a radius of a couple miles, then up-vote the messages they like and down-vote the ones they don’t. According to the Times, the hyperlocal aspect of Yik Yak has made it popular on high school and college campuses, while the anonymous part has made it fashionable among cowardly jerks. Since its launch, anonymous mobs have leveraged Yik Yak to taunt trans people at Utica College, spew racist epithets at Emory, bully a suicidal girl at an Atlanta high school, and terrorize the whole Michigan State campus with an anonymous threat of gun violence. At Eastern Michigan University, students once logged on to Yik Yak to taunt and sexually harass their professors from the back of the class during the lecture. That premise—high-status young men exact revenge over higher-status young men!—is easy to scoff at, particularly given Yik Yak’s apparent popularity among college-aged racists. (Case in point: When a group of students at Colgate University gathered to protest the school’s diversity policies, Yik Yak filled with hateful comments like: “I love black people, my maid was always nice to me.”) But in practice, the setup has a wide and diverse appeal that’s spread beyond the frat house. Sam Dekker, a star basketball player at the University of Wisconsin with more than 50,000 Twitter followers, dissed Yik Yak via tweet this week, writing: “I had yik yak for like a week. All I learned is that people don’t like going to class and that ‘Netflix is bae.’ ” But Dekker gets more than 400 favorites for tweets like: “Feels good wearing just a sweatshirt to class #Spring.” Why allow NCAA basketball players with massive follower counts to channel all that power? While users can only post and vote on yaks in their current geographic area, anyone can “peek” at another location around the world. (The app suggests checking out the feeds of “USC” and “Tibet.”) In that way, the app functions a bit like a referendum on a specific area’s youth culture. What are the kids talking about? During the anniversary of the 2007 Virginia Tech school shooting, for instance, Yik Yak functioned as an ad-hoc memorial for the victims. Yakking last weekend from Brooklyn and Manhattan, I got a window into what is popular with the youth by watching other users up-vote statements of broad values (“Go to hell ISIS”; “RIP Biggie”), more specific critiques of the local campus culture (“I wish people would binge read”), and lots of overtly political speech (International Women’s Day inspired a flood of feminist yaks). Some of the positivity I noticed may result from Yik Yak’s concerted effort to boost its community’s tone. The first rule of Yik Yak is: “You do not bully or specifically target other yakkers.” The second rule of Yik Yak is: “You DO NOT bully or specifically target other yakkers.” Users are encouraged to down-vote or report “useless or offensive” messages; if a yak gets enough negative votes, it disappears from the app; chronically offensive users are threatened with suspension. And the app’s founders have added new features in an attempt to keep things civil: In addition to the virtual schoolyard fences, the Times reports that Buffington and Droll recently added “filters to prevent full names from being posted” and a new warning message that pops up when users type certain sensitive words, like “bomb.” Most social networks can’t be bothered to exert a fraction of that effort. And yet, Yik Yak still gets a bad rap. In a recent interview with Gigaom, Buffington said, “If you ask a college student, ‘What is Yik Yak?’ they’ll say it’s the best app ever and they use it every day. If you ask a parent, they’ll say, ‘I heard it’s a nasty app.’ ” Maybe the grown-ups should stop reading about Yik Yak and try it out instead.